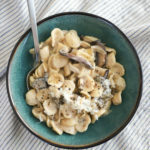 I use shiitake and cremini (baby bella) mushrooms for this, but any kind of ‘shroom you like is perfectly fine. 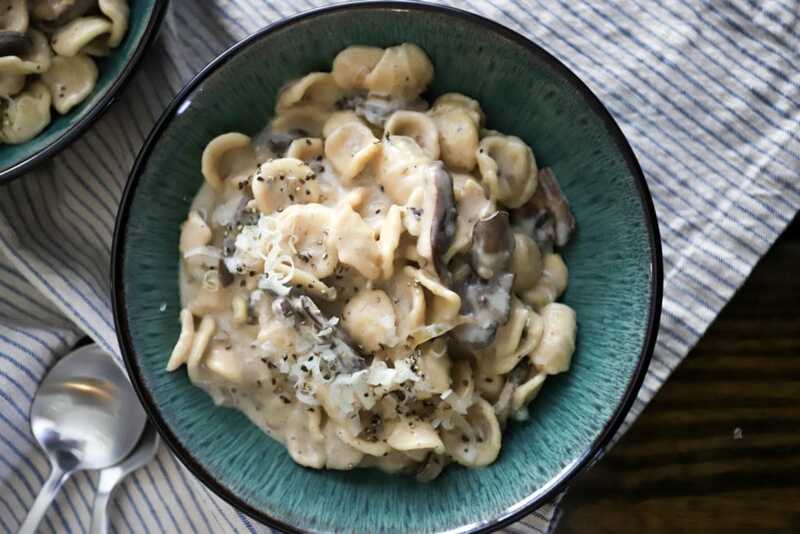 This combination gives a great flavor, but you can use one of those mushroom blends, all one kind of mushroom, anything you enjoy. 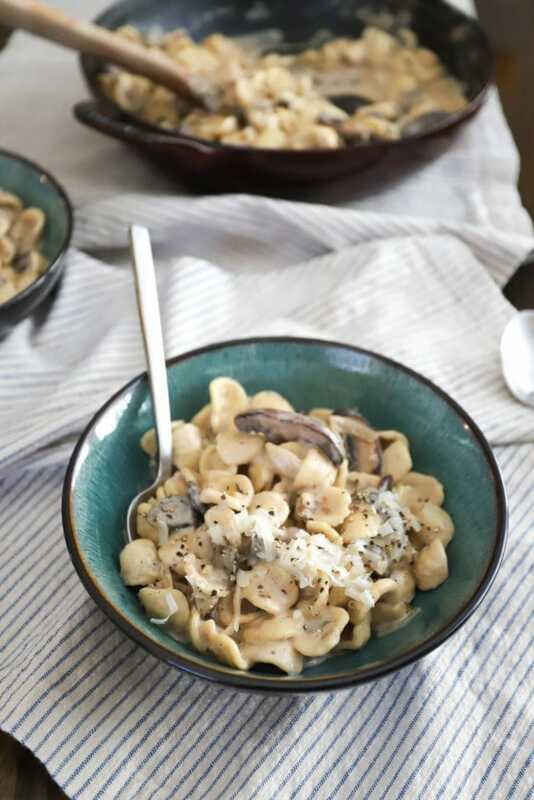 Besides that, you’ll need a short pasta (Beck is super obsessed with orecchiette for some reason), sliced shallots, butter, flour, milk, and parm. PS these baby hands are because Beck was helping and said “should my hands be in this picture of the food?” so of course I decided they should be. Some notes on these ingredients: the parm kiiiiind of needs to be freshly grated if you can manage it because it’ll melt into the sauce better that way. BUT, this is an instance where imported Parm isn’t necessary at all unless you’re into that kind of thing. We have a local Parmesan that we love and it has great flavor without costing a million dollars. Same goes with shallots. 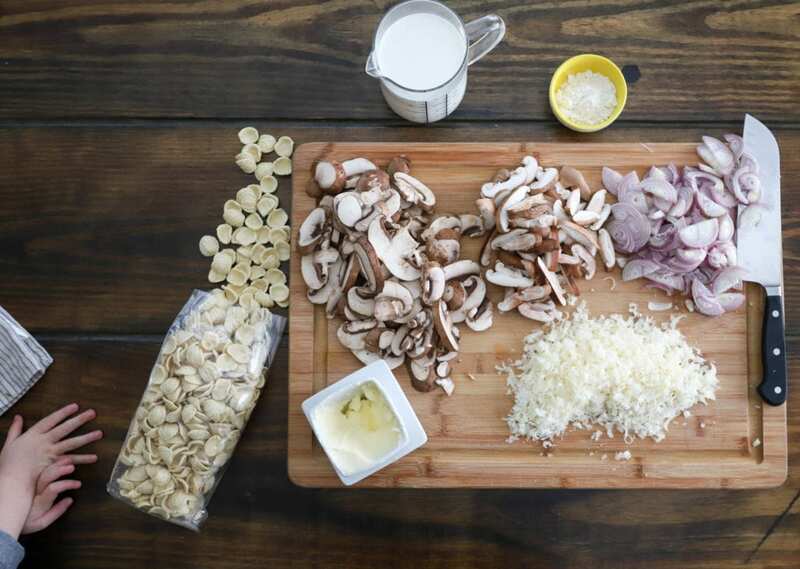 If you don’t want to use them use onions, garlic, or a combo of both! I like shallots because they do double duty, flavor-wise. First! 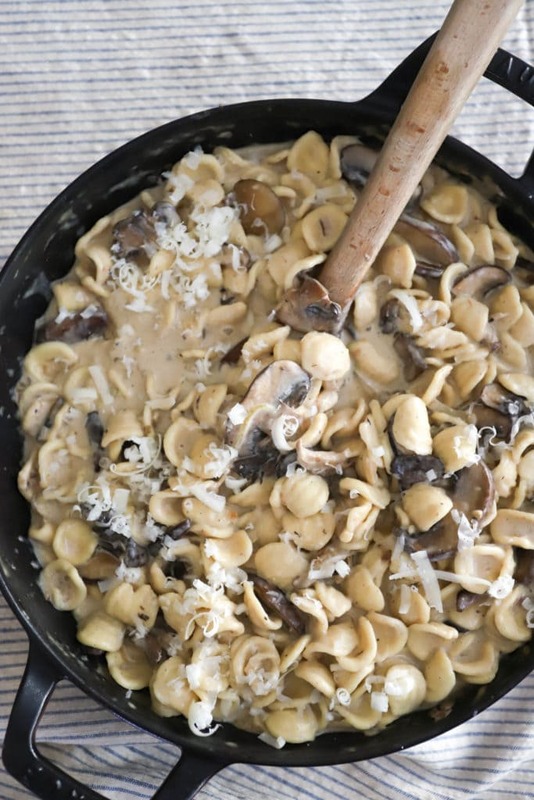 Start your creamy mushroom pasta by boiling the noodles to al dente. 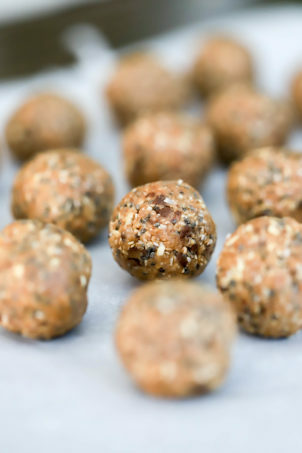 When you drain them, save a cup or so of the cooking water to thin out the sauce later. 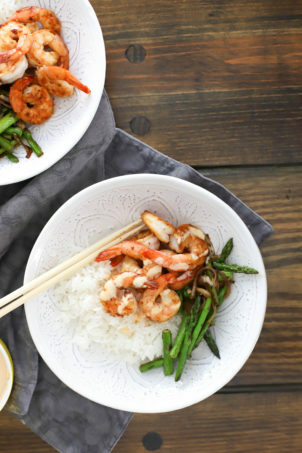 At the same time, heat a large skillet to medium-high heat with a drizzle of olive oil. 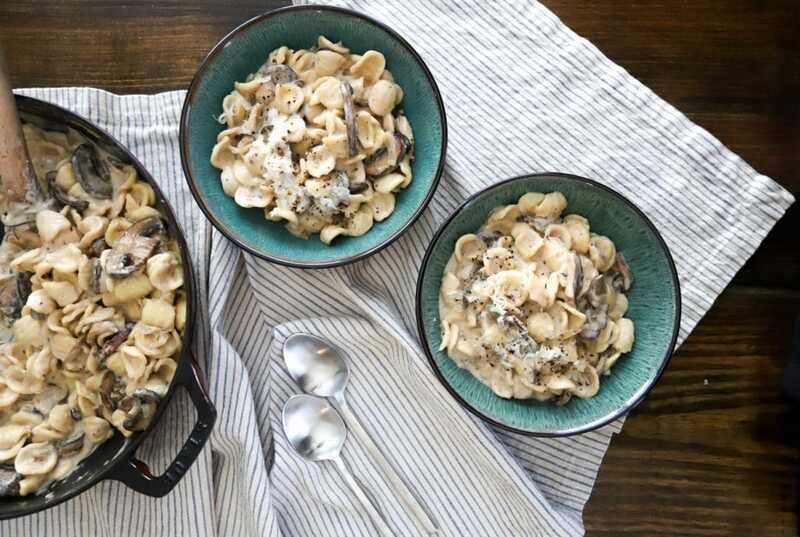 I use my favorite Staub braiser for this – it’s three or so quarter and just barely fit all of the sauce and noodles for this. 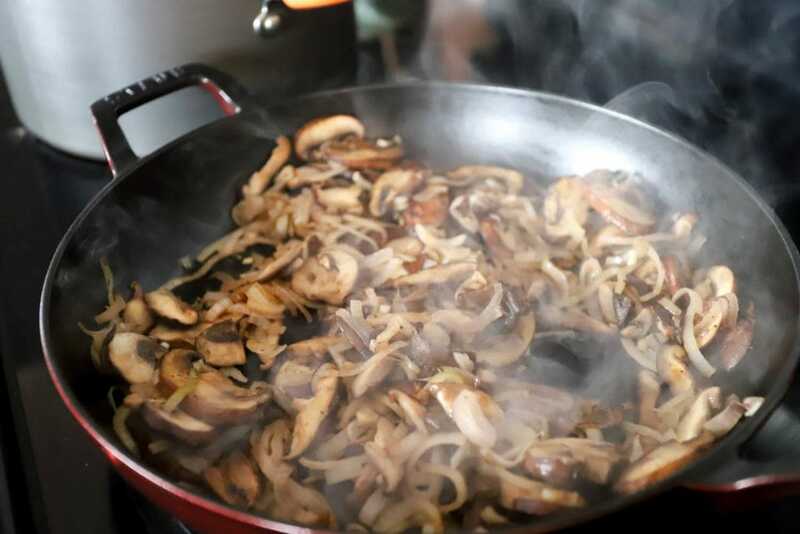 When the oil is hot, add the mushrooms and a sprinkle of salt to the pan. Saute the mushrooms for five minutes, stirring every once in awhile. 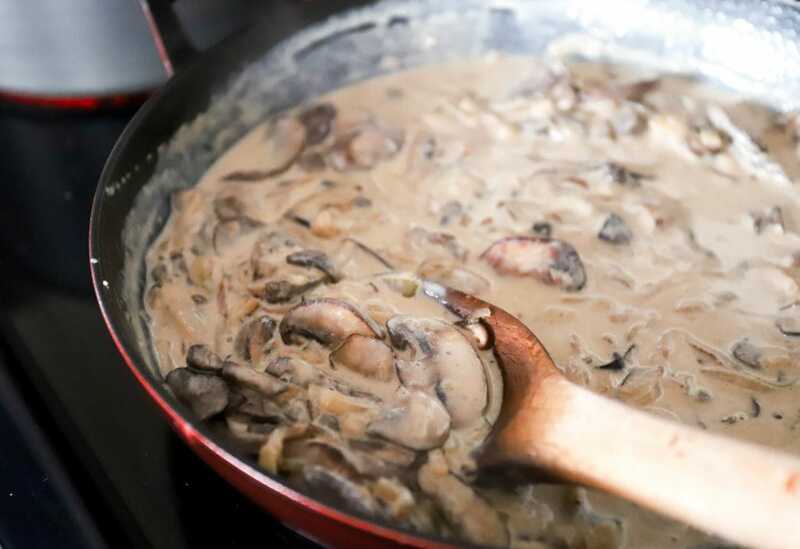 When the mushrooms have started to brown, soften, and release some liquid, add the shallots and stir them into the mushrooms for another five minutes. Now we built the sauce! 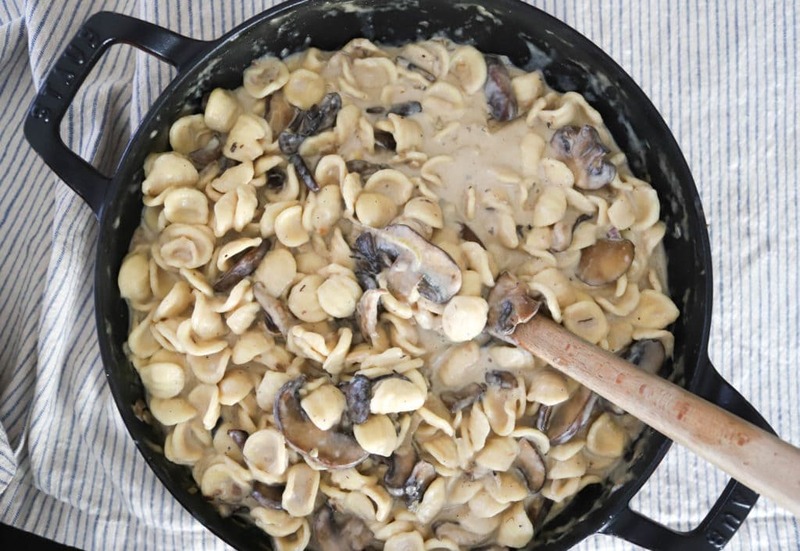 Sprinkle the flour over the mushrooms and add the butter to the pan. Stir to coat the mushrooms in butter and flour, and let the mixture cook for a minute or so. Next, slowly pour in the milk or half and half (you know which one I vote for) and stir as you go to combine the milk with the flour and thicken the sauce. Scrape the bottom of the pan as you do this, and turn the heat down if the milk bubbles too quickly or scalds on the bottom of the pan. 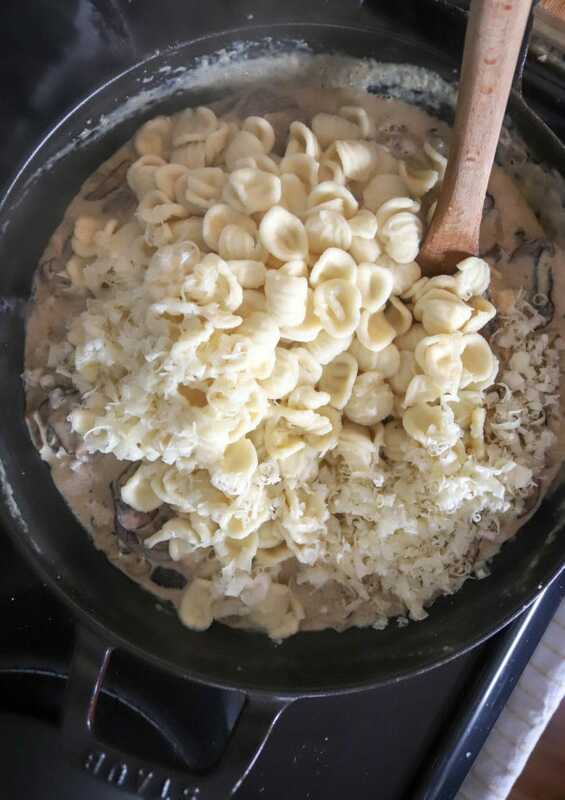 When the milk is all incorporated into the mushroom mixture, add the pasta, parmesan, and about a half cup of the pasta water. At this point, stir everything together and start adjusting. Salt, pepper, a little more pasta water all are involved until the mixture tastes great and is coated in sauce without being soupy. Let the mixture simmer for just a minute or so to marry all the flavors, and YUMMY WHITE FOOD WHY SO GOOD WITH NO GREEN STUFF. Top with extra parm and tons of pepper, obviously. Oh look! The bowl is kind of green so we’re covered on a health front. This is SO good. 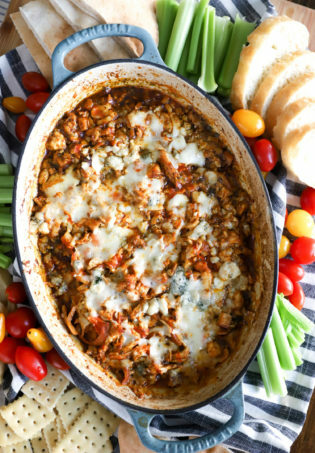 It’s hearty but not overwhelmingly heavy because we get lots of flavor from the cheese without using too terribly much. 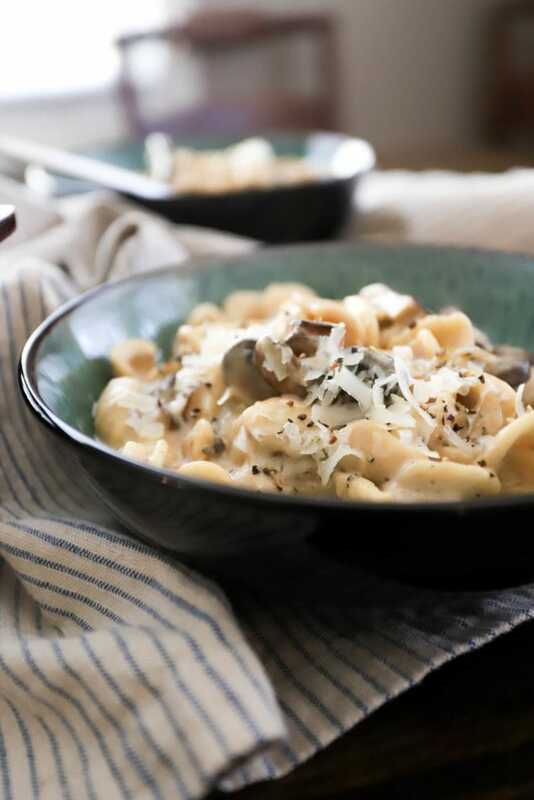 The mushrooms contribute to the sharp cheese flavor and tender pasta is just what we need some weeknights, right? You could add my fave kale salad to make this a little more balanced, or use green dishes and call it good. Enjoy this! It’s great to have in your pocket for a quick dinner. 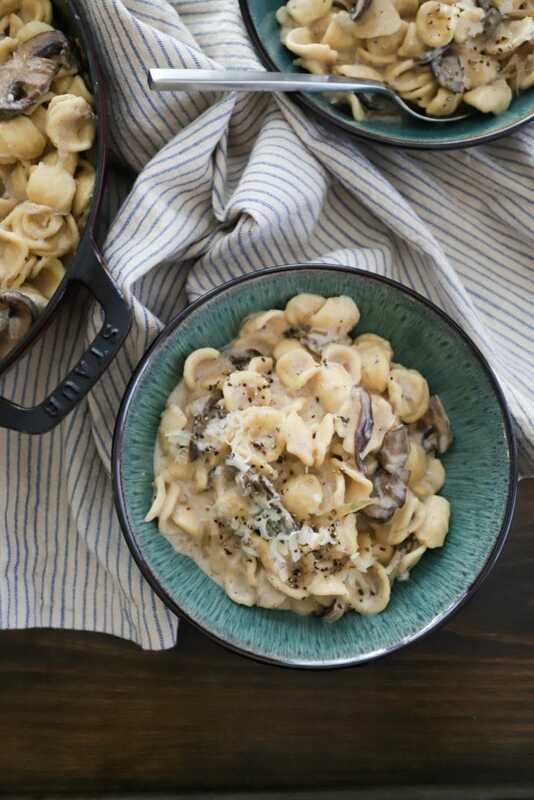 Sharp, creamy mushroom pasta comes together in just thirty minutes with a silky parmesan black pepper sauce. YES is the word you’re looking for! Cook the pasta to al dente in heavily salted water per the package directions. Right before draining, scoop out and save about a cup of the cooking water. Meanwhile, preheat a large skillet to medium-high heat with a drizzle of oil. 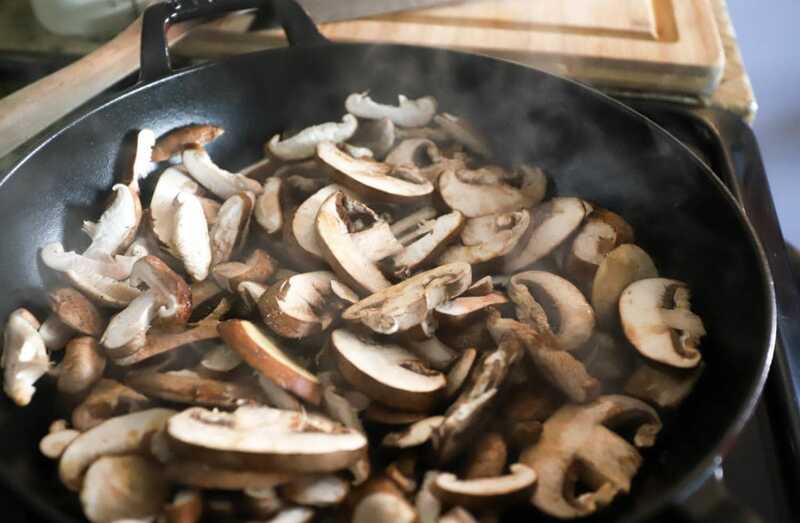 Add the mushrooms with a sprinkle of salt and saute for five minutes. Add the shallots to the pan and stir for five minutes more to soften. 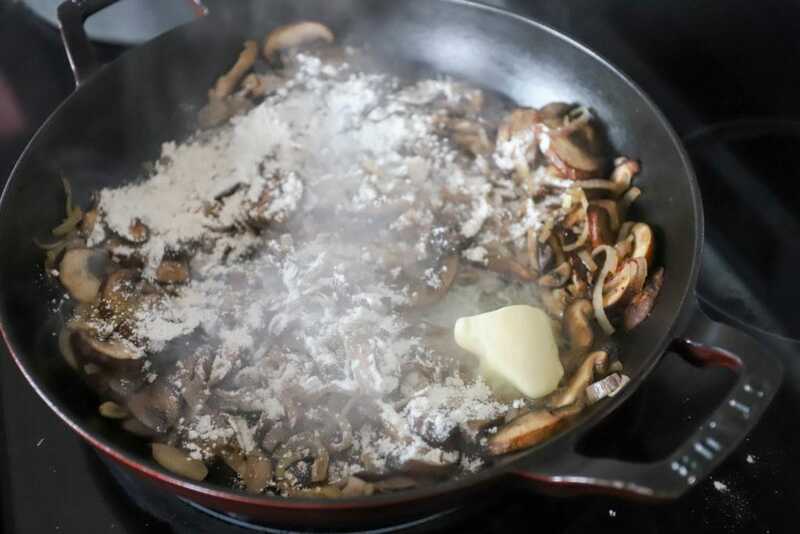 Add the butter to the pan and sprinkle the flour over the mushrooms. 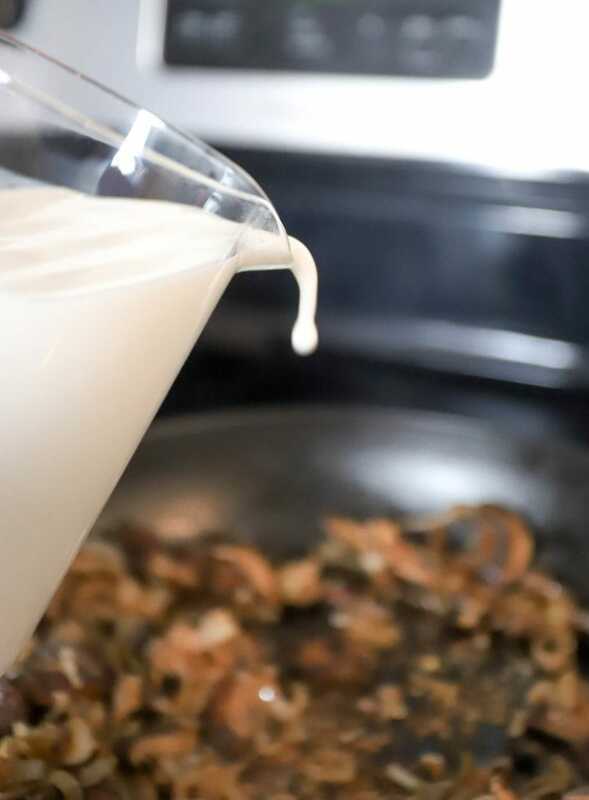 Stir to coat for one minute, then very slowly drizzle in the milk or half and half to create a bubbly sauce. Turn the heat down if the sauce bubbles very aggressively. Add the pasta, 1 cup of grated parmesan cheese, and a splash of pasta water to the sauce. Stir to combine. At this point, adjust! Add salt and pepper, more pasta water or parmesan, and stir a few times until the pasta is coated but not soupy and the sauce tastes great. 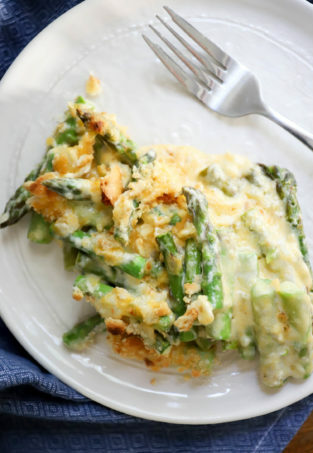 Serve with extra parm and black pepper. Enjoy! This is the skillet I use! It’s one of my absolute favorites. Feel free to use any mushrooms that you like, and change it up each time! 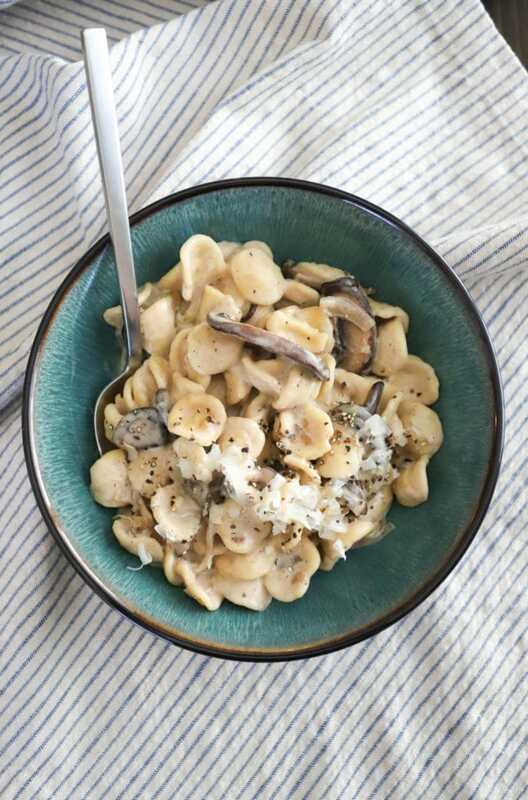 The wild mushroom blends that are already stemmed and sliced are particularly quick and easy. 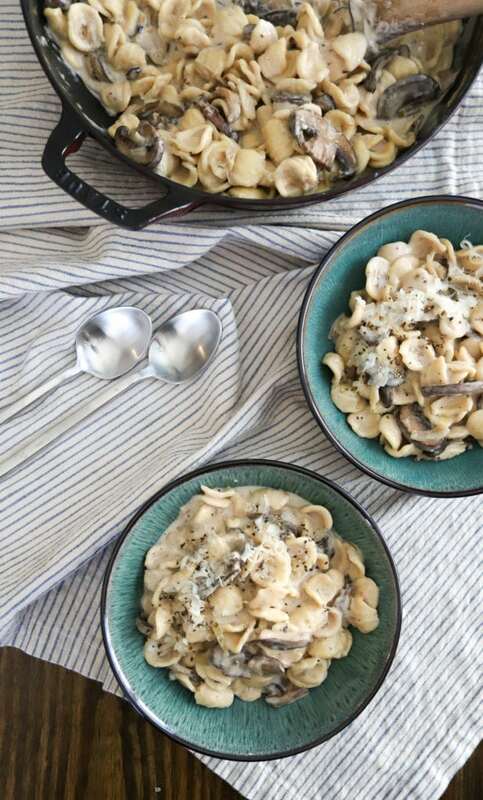 I like freshly grated parm for this because it melts nicely into the sauce, but you DON’T have to use imported Parmigiana Reggiano – any parmesan will work well as long as you grate it yourself! Or don’t, it’ll be fine either way. It was delicious! Those beautiful little fingers are precious!